Brookfield Property Partners has acquired an interest in Urban American's Putnam Apartment Portfolio (approximately 4,000 units) which includes Roosevelt Landings on Roosevelt Island in a transaction valued in excess of 1 Billion Dollars. Sources who are familiar with the transaction confirmed that Urban American will continue to own the properties in partnership with Brookfield and will continue to operate and manage the buildings. Among the assets owned by Brookfield Property Partners are the 5 buildings with 8.4 million square feet of office space and 277,000 square feet of retail at Brookfield Place, formerly the World Financial Center. Not known at this time if RIOC's consent is needed for the ownership change at Roosevelt Landings. Will update with any further information. On August 7th, as I was walking with my mother for dinner to celebrate her birthday, I was attacked by a group of young people on Roosevelt Island. They called us “Osama bin Laden” and told us to “go back to your country.” One of them punched me in the face. Another one punched me in the back of the neck. I tried to pursue them but had to call the police and go the hospital. My family and I always deplored hate crimes from a distance. 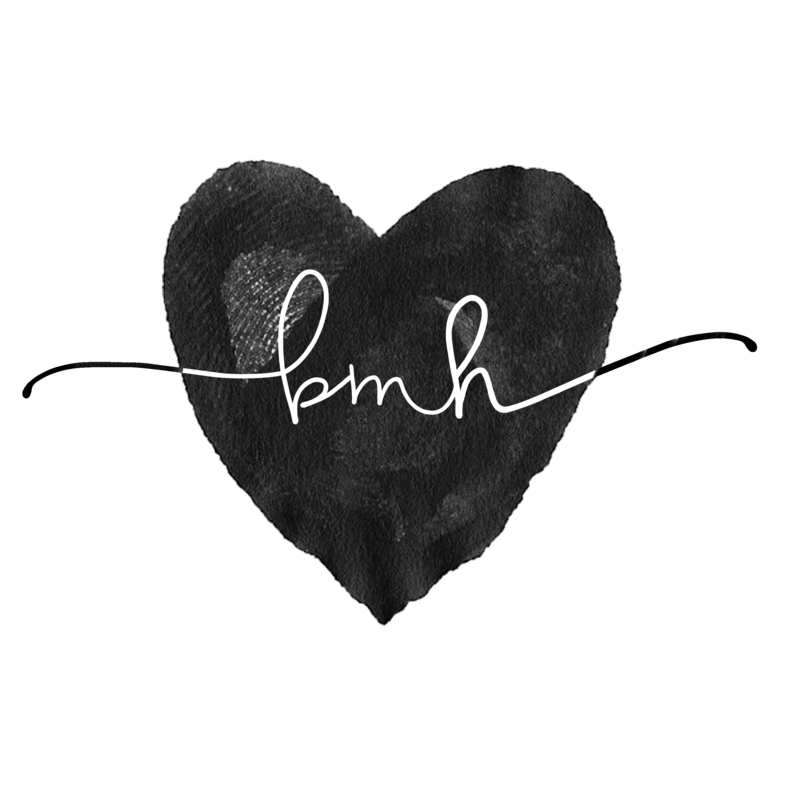 Ever since August 7th, we now had to experience not just the pain inflicted from such a crime but also have to bear the agony during the healing process. How come young minds that have so much to learn and explore have become the breeding grounds of hatred? Should we hold these teenagers accountable or their parents, or the education system here in New York City, which has failed them and as a result has failed us? My mother and I were called “Osama bin Laden.” Is the “O” word the new “N” word? Ever since 9/11 happened, the whole world changed forever. Sikhs became victims of hate crime in increasing numbers. Despite so many resources being channeled towards diversity awareness campaigns, Sikhs are still being attacked. We need more proactive strategies at all levels of society to end this bigotry. Not taking any action is a recipe for disaster and an invitation for further abuse/crime. I look for justice but not for vengeance. If these young people or their parents come forward and accept their fault, we can let the healing begin and take a positive approach to involve them in the community and pass a message of peace and tolerance to society at large. 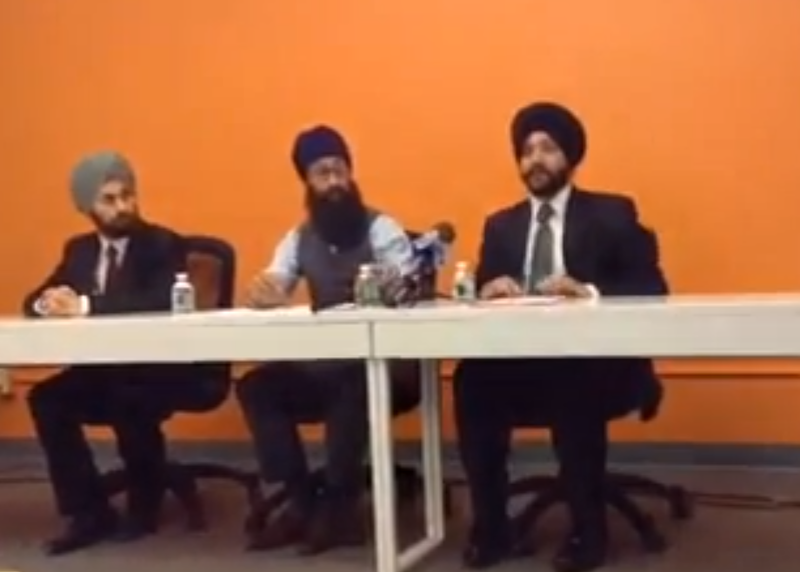 Three Sikh men—all violently attacked because of their turbans in separate New York City hate crimes—today called on government and police leaders to enact policy reforms to address violence and discrimination against minority communities in New York City. At a press conference organized by the Sikh Coalition, Dr. Jaspreet Singh Batra, a medical scientist, recounted how he was attacked and injured last Thursday on Roosevelt Island. Speaking via video because of the seriousness of his injuries, Sandeep Singh, a business owner and father, deemed his slow recovery a “miracle” after being run over and dragged by a driver in a pick-up truck on a public street in Queens late last month. Both assaults, which were accompanied by racial and religious slurs, occurred almost one year after Dr. Prabhjot Singh was attacked in Harlem. Dr. Singh joined the men in solidarity. According to surveys by the Sikh Coalition, violence and discrimination affect Sikhs of all ages. According to one report, 60 percent of Sikh children in New York City have experienced bullying and harassment because of their religion, and 9 percent of Sikh adults have been physically assaulted because of their religion since 9/11. Sikh advocates believe that the New York Police Department (NYPD) contributes to the problem by refusing to hire turbaned Sikhs who wish to serve as police officers, and the Sikh Coalition has called on government officials to create a task force to systematically address hate violence and discrimination against all communities in New York City. The statements from all press conference participants are available at the Sikh coalition web site. Will have more on today's press conference later and here's post from last Friday about the incident. will be closed over Labor Day Weekend. 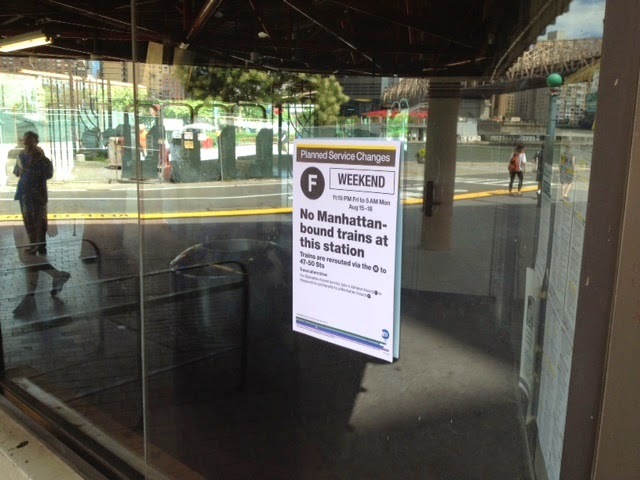 The free service will resume the following Saturday. 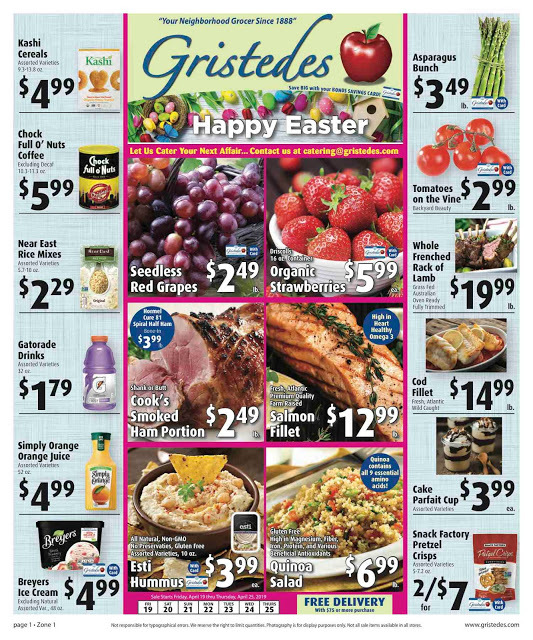 Reminder: The shop is open from 10am - 2pm but the line will be cut off at 1:30pm in order to ensure a 2pm closing time. 2. 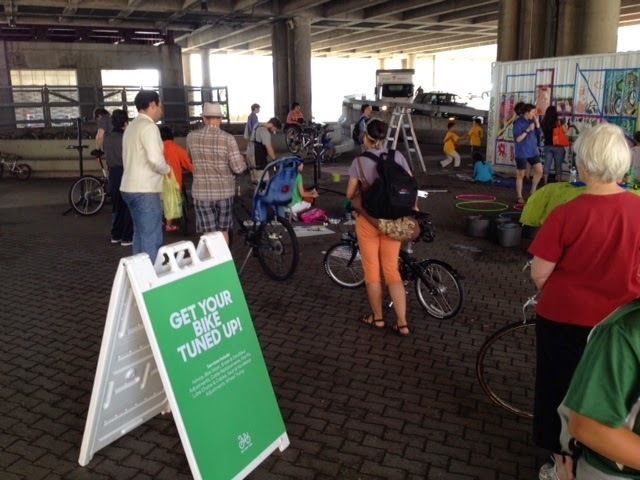 There are a few more spots left for the ride to Summer Streets this Saturday, August 16 at 9am. We'll ride over the Queensboro Bridge to Park Avenue in Manhattan where the streets are going to be open to cyclists and pedestrians (no cars!) from 7am - 1pm. Participants must bring their own bikes and helmets. For more information and to register please email cgoodspeed@bikenewyork.org. The next ride in our free summer series will take place on Thursday, August 21. We'll meet at our container under the helix ramp at 6:15pm for a ride around the island. Bikes and helmets will be provided! Post-ride we'll head to a local establishment for dinner (riders are responsible for their own dinner). 3. We have two classes for Roosevelt Island residents only coming up! Bikes, helmets, and great instructors will be provided for both classes. The first class will be held at Sportspark Gym on Tuesday, September 9 from 10am - 1pm. The class is called Bicycling Basics and it's designed for people who know how to ride a bike but would like to gain better handling skills. Please click here to register. The second class will be held at the Capobianco Field basketball court on Saturday, October 5 from 10am-12pm. 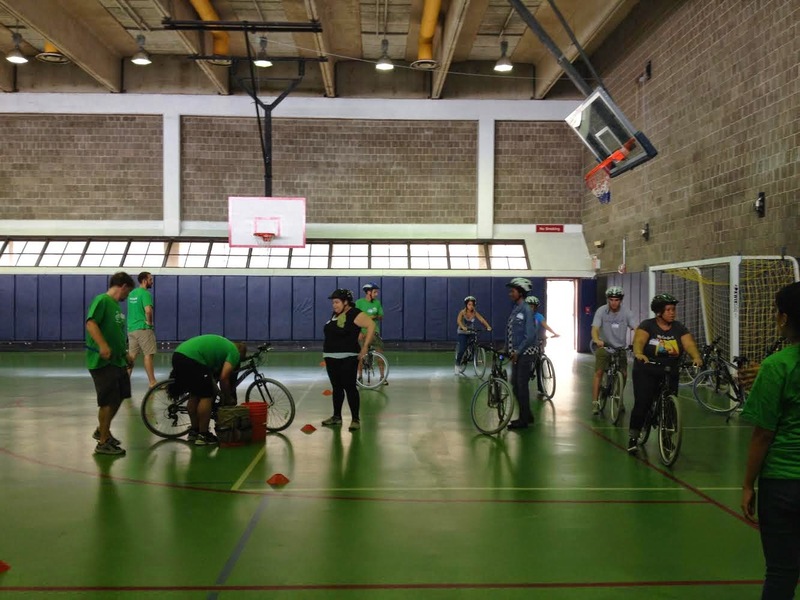 It's a Learn to Ride-Adults class designed for adults who don't know how to ride a bike. Please click here to register. 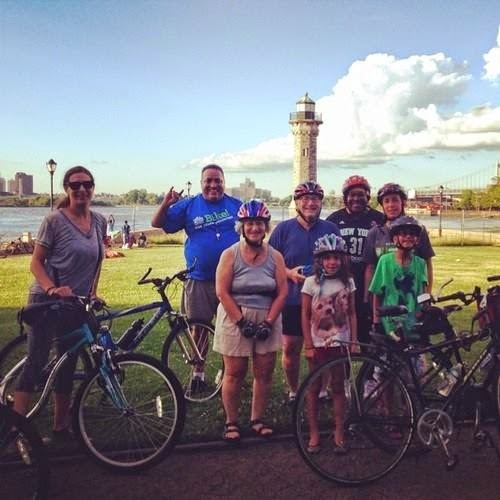 More information on Bike New York's Roosevelt Island summer programs from previous post. 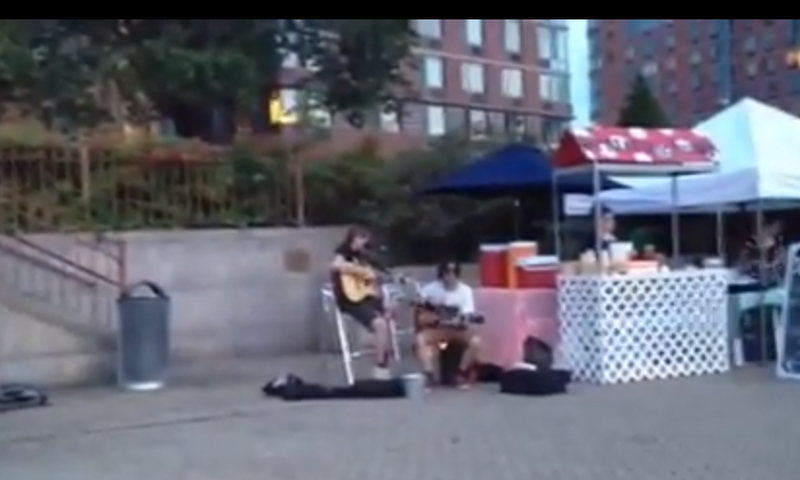 Don't forget to sign up for Roosevelt Island Local Performer Night on Eleanor's Pier! The response is great and we are extending the show to Saturday night! It's this weekend, 8/15 & 8/16. Get your name on the list at Main Street Sweets and you will be contacted about your approximate time slot. Please sign up by 5pm tomorrow! Here's a duo of local performers recently at Eleanor's Pier. 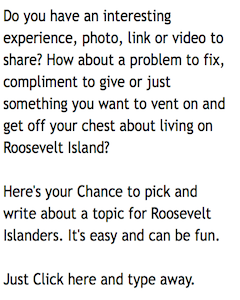 Also, Roosevelt Island Listings has a call out for jazz musicians. Here's a couple of Roosevelt Island guys, Shucks Road, who shot a music video near Eleanor's Pier last year. They are pretty good. Unfortunately, it looks like Shucks Road broke up the band. The NY State Inspector General not only released a report on corrupt practices taking place at the Roosevelt Island Operating Corp (RIOC) under a prior RIOC President and staff last week, but also issued a letter regarding the RIOC Public Safety Department under a previous RIOC President and staff. 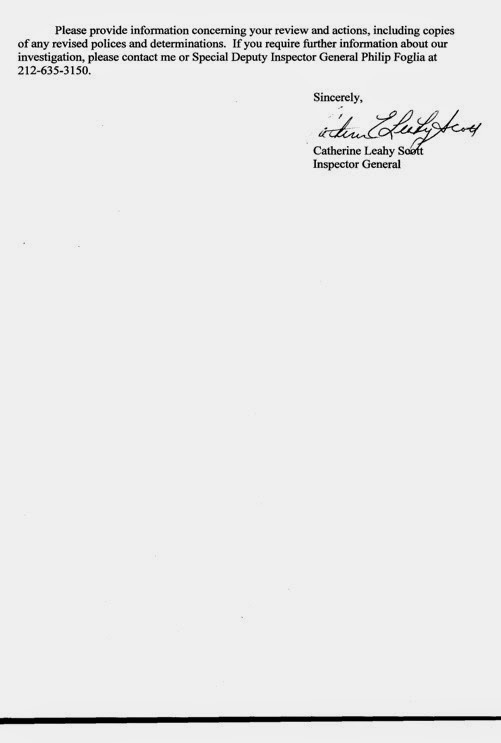 Here's background regarding the Inspector General's Roosevelt Island Public Safety letter. ... Yesterday, the Daily News in an article titled "So-called 'peace officers' on Roosevelt Island are being sued over savage beating of 20-year-old who claims he was just waiting in front of a building" reported that Roosevelt Island resident Anthony Jones suffered fractured ribs and a pierced lung in an 'unprovoked' attack without being charged with a crime at the hands of state employees and officers of the Roosevelt Island Operating Corporation's Public Safety Department. Following the February 16, 2013 Roosevelt Island Public Safety Accountability/Brutality Demonstration, Mr. Kallos again called for an investigation of alleged brutality incidents by RIOC Public Safety Department. RIOC Dirctor Margie Smith said on February 28, 2013 that the brutality allegations presented to the RIOC Board will be forwarded to the NY State Inspector General for review. 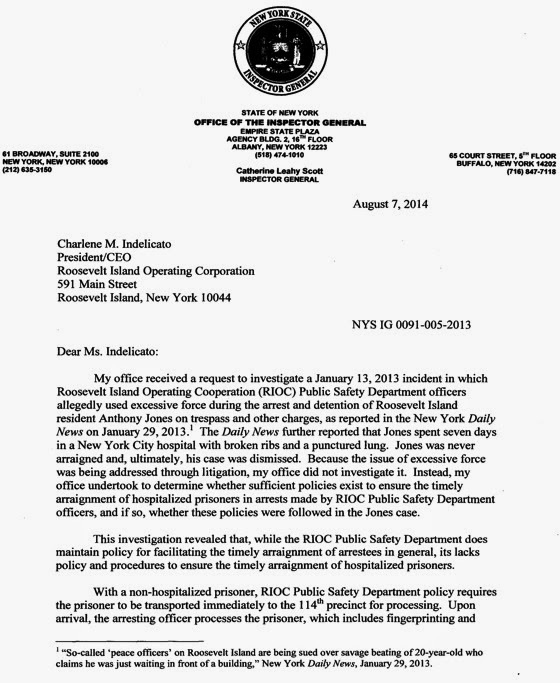 Here's the Inspector General's letter to RIOC President Indelicato. Here's full copy of the Inspector General's letter to RIOC President Indelicato. RIOC PSD has addressed the issue of timely arraignment of arrestees by additional training, and developing policies and procedures that will ensure the timely arraignment of hospitalized prisoners. Also, note that the brutality allegations described occurred prior to the time current RIOC President Indelicato and Public Safety Department Director Jack McManus took their positions. The current RIOC Board members were all serving during this period of time. 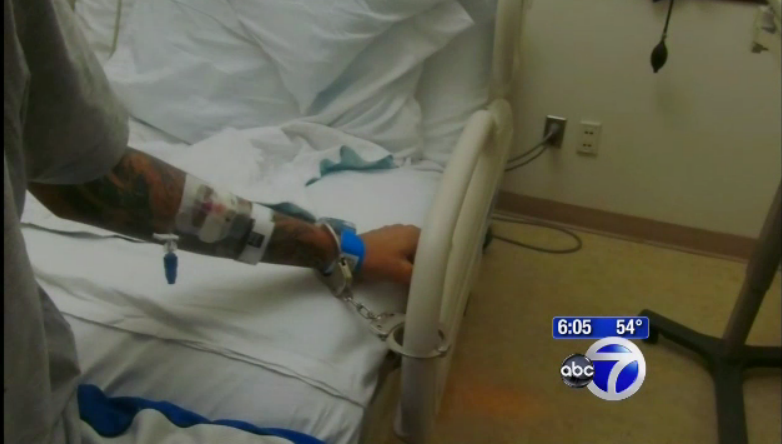 Here's a Channel 7 January 30, 2013 video report about the Jones incident. The lawsuit has reportedly been settled by RIOC and the Jones family. 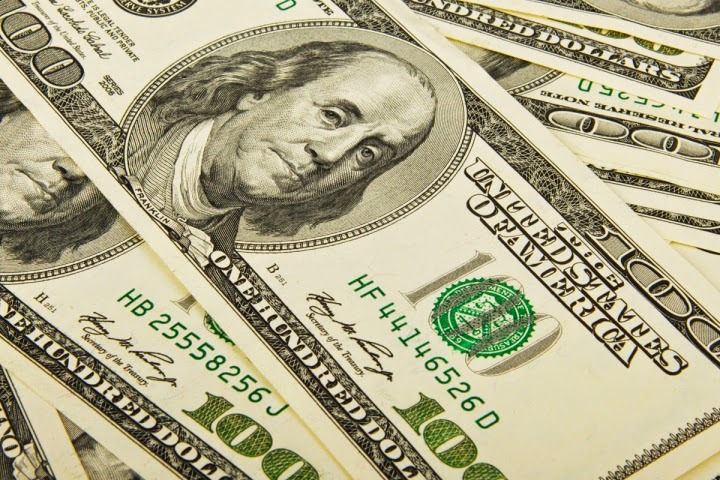 No details of the settlement have been publicly released. The PSC will respond directly to the IG regarding this information. 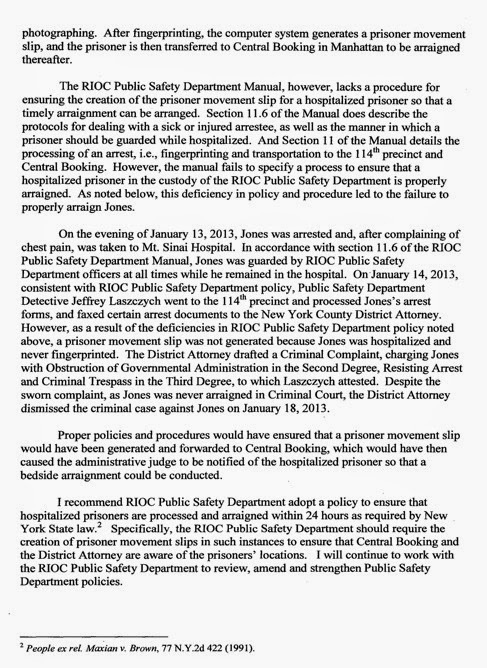 We find it incomprehensible and unacceptable that the IG's letter focuses solely on the Anthony Jones incident in relation to PSD policies toward hospitalized detainees, rather than the clear pattern of abuse and misconduct of the Roosevelt Island Public Safety Department under the regime of Keith Guerra. The PSC documented numerous cases of Island residents and visitors who were the recipients of unprovoked violence and unconstitutional policing over many years. These testimonies were forwarded to the IG office by the RIOC Board and Ben Kallos's office. The posture taken in the IG letter criticizes the PSD for failing to properly arraign Anthony Jones, thereby jeopardizing a credible prosecution, rather than the false arrest and brutal mauling that almost took his life. The PSC registers our strong rejection of the narrow scope of the IG letter which ignores the victims of a dark period in Island history. Island residents united in a struggle that led to Guerra's resignation. We will continue to fight for the record to be set straight. Truly sad news about the death of actor and comedian Robin Williams yesterday at the age of 63. He brought great joy, laughter and tears to many with his performances. 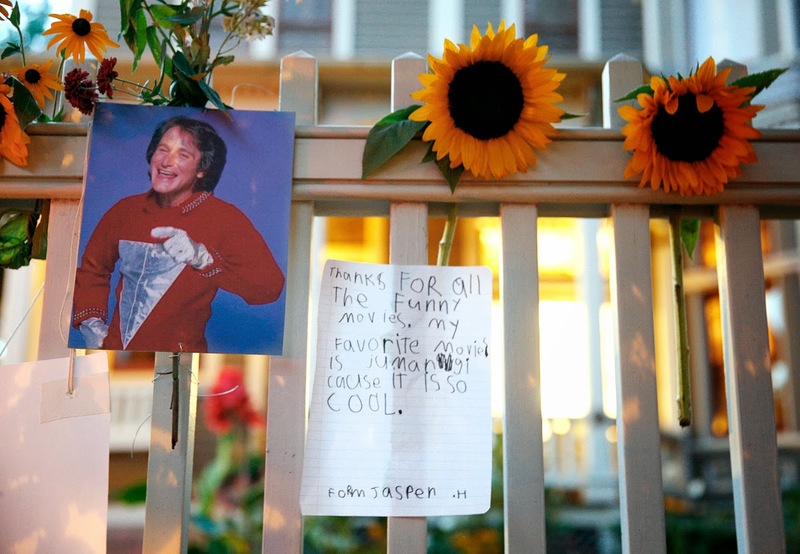 More coverage and remembrances of Robin Williams from Andrew Sullivan's The Dish. 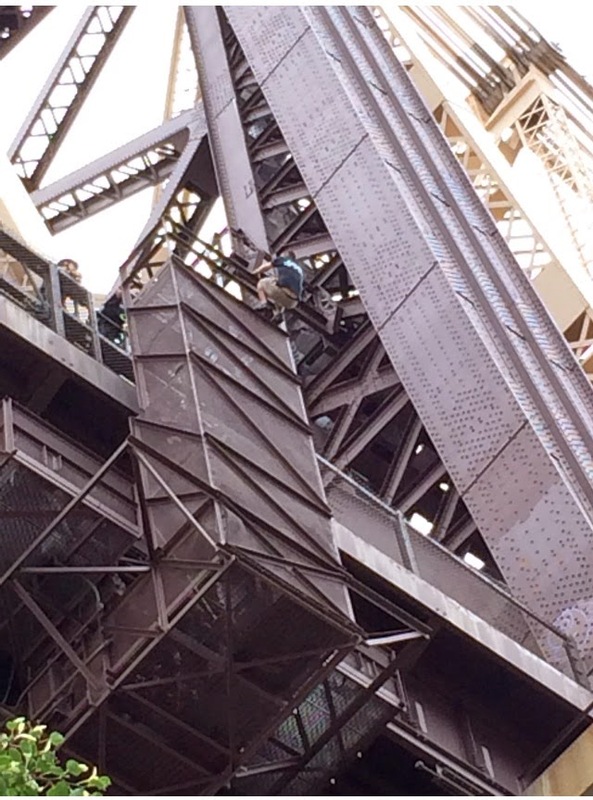 as the NYPD Emergency Services Unit worked to prevent a man jumping from the Queensboro Bridge. 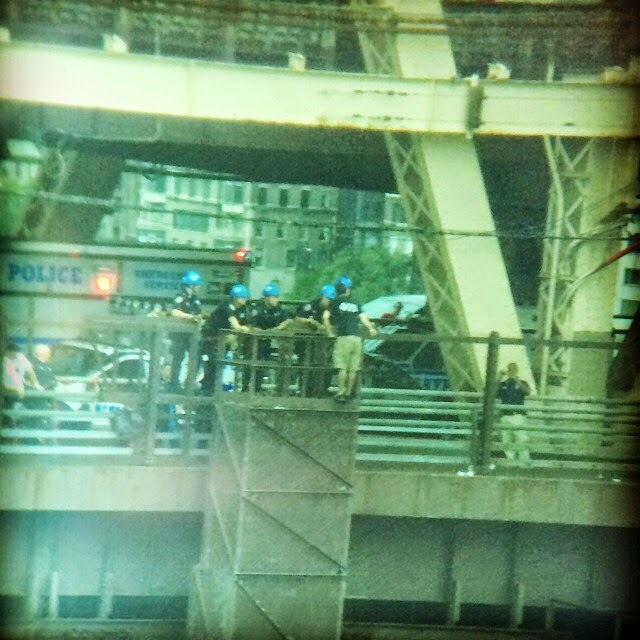 After a very tense two hours, the NYPD Emergency Service Unit Officers rescued the man and brought him to safety. Great job by NYPD. Citizens Union NY State 76 AD Democratic Party Candidates Debate Tonight - Who Will Represent Roosevelt Island And Upper East Side In NY State Assembly, Gus Christensen, Ed Hartzog, David Menegon Or Rebecca Seawright? The four Democratic candidates of New York State 76th Assembly District (Upper East Side and Roosevelt Island) will be participating in a Primary debate vying to replace outgoing assembly member Micah Kellner. The Primary Election will be held on September 9th. WHERE: Lenox Hill Neighborhood House, 331 East 70th Street, between First and Second Avenues. debates@citizensunion.org or call 212-227-0342 x 39. The Roosevelt Island Residents Association (RIRA) hosted a Meet The 76 AD Democratic Party Candidates Town Forum on August 5. The Candidate Town Hall Meeting began with RIRA Governance Committee Chair Sharon Pope and RIRA VP Sherrie Helstien introducing the format for the evening to a standing room only audience at the Good Shepherd Community Center. and more. Will upload video from the rest of the Roosevelt Island 76 AD Democratic Party Candidates Town Hall later as an update. Roosevelt Island Residents Association (RIRA) President Jeff Escobar had the following to say regarding the recent NY State Inspector General's (IG) Roosevelt Island Operating Corp (RIOC) corruption report and the possible hate crime incident against a Roosevelt Island Sikh resident now under investigation by the NYPD. The past administration of then RIOC President Torres, Vice-President Martinez and CFO Chironis was prior to the current RIRA administration, and well before my time as RIRA President. The community thanks the Inspector General for its service and report, and has every confidence that the current RIOC administration will not engage in such practices as identified therein. Roosevelt Island is a diverse community that takes pride in its differences and ability to come together, no matter a neighbor's background. Violence of any sort or form on our Island should never be tolerated, regardless of its basis. News of any attack that occurs on Roosevelt Island is a disturbing one, and we will be asking our RIRA Public Safety Committee to closely monitor and report on the situation. Still no comment for the RIOC Board of Directors on the IG Roosevelt Island corruption report. The RIOC governance structure is deliberately kept weak by Albany so that Albany leaders can exert maximum control over development decisions. Having a weak structure may suit the Governor and the legislative leaders, when it comes time to making development decisions that may be unpopular with the local populace, but having a such a weak structure also means the potential for corruption is “unlimited:” For every “scandal” that the IG uncovered, there are probably ten more that remain hidden. The RIOC governance structure, as weak as it is, is a recipe for disaster and an invitation to abuse. I am distressed by this violent attack on a man walking down the street on RI minding his own business – an attack that occurred because of prejudice and hate. He was attacked because he “looked different” or “dressed differently” than those that attacked him. This is prejudice and those that attacked this innocent man must be found and brought to justice for their hateful deed. We are all brothers and sisters, and cultural differences should be celebrated, not looked upon with suspicion or hate. This is true everywhere, but especially on RI with its large number of residents of all nations employed by the United Nations, an organization dedicated to peace and brotherhood. (1) I call on RIOC and PSD to immediately disseminate information to the community, perhaps starting with presentations at the school and/or at churches or other community organizations, pointing out that brotherhood is key and dispelling religious, cultural, ethnic, or racial prejudice, which has no place on RI, in NY, or in the US. Despite the monumental and long overdue achievement of electing and re-electing an African American President after approximately 265 years of the existence of the United States, bringing the hope that America had finally entered a “post-racial” age, cultural/ethnic prejudice still unfortunately exists. It is up to us to call for the preservation of our community’s peace and security by requesting that RIOC and PSD immediately implement an education program as outlined above. (2) PSD needs to allocate officer resources more effectively. If necessary, if there are inadequate number of officers, the NYPD can supplement the presence of officers on the ground. 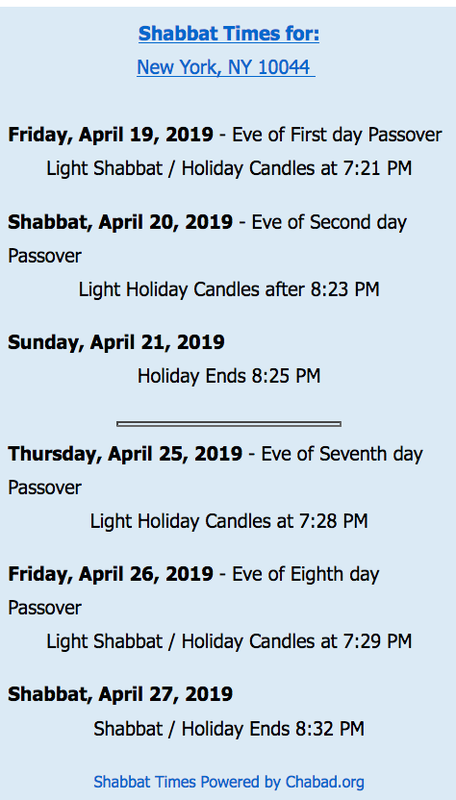 To be the victim of hateful slurs and violently attacked at 8PM – when the sun is in fact still out at this time of year – is unacceptable here, in our community, or anywhere else in the US. Where was PS when this attack occurred? Residents need to be reassured that their reasonable expectation of security on the island is well-founded. Perhaps a Town Hall meeting wherein PSD can describe the measures they take to ensure residents’ security can be held. It is important to note that no determination has been made by NYPD that a "hate crime" occurred. The incident is being investigated. ...I am aware of these organizations that have received funding and amounts. Is the list accurate? Roosevelt Island organizations may not have to wait until next year to receive NYC Council discretionary funds. If you missed out on applying last time for NYC Council discretionary funds, here's another opportunity. 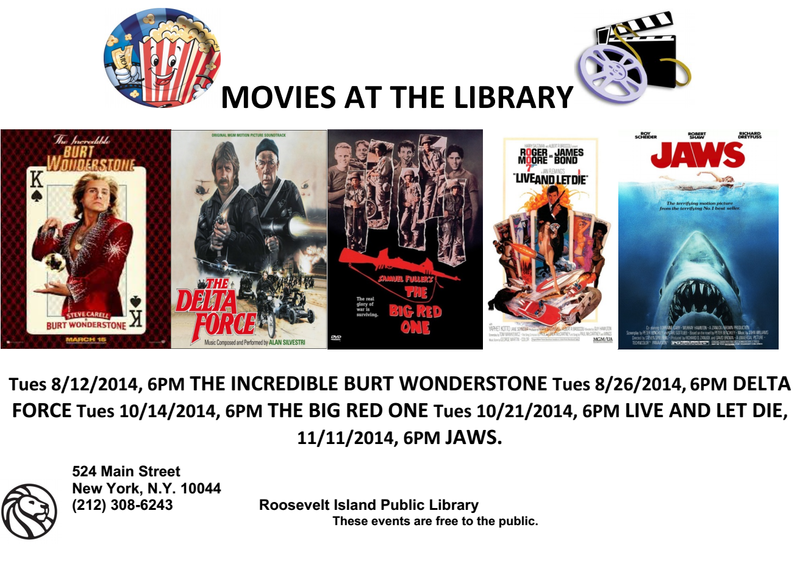 You're invited to free monthly movies at the Roosevelt Island branch of the New York Public Library. 8-12-2014 The Incredible Burt Wonderstone (2013) (PG 13). Lots of laughs in this wacky parody of the Magic business as Steve Carell, Steve Buscemi & Jim Carrey star as competing Magicians. 8-26-2014 The Delta Force (1986) (R). Tough guys Lee Marvin and Chuck Norris combat ruthless terrorists who have high-jacked a passenger jet. 10-14-2014 The Big Red One (1980) (R). Lee Marvin plays a grizzled Army Sargent who leads a group of men into combat against the Nazi forces in World War II. Also Starring Mark Hamill and Robert Carradine. 10-21-2014 Live and Let Die (1973) (PG). Roger Moore stars as secret agent James Bond (license to kill 007). Bond does battle with a deadly crime organization that has tentacles in the heroin trade as well as politics and assassination. Bonds adventures take him to NYC, New Orleans, and the Caribbean. 11-11-2014 JAWS (1975) (PG). The idyllic peace of a beach community is destroyed by the menace of huge and ravenous Great White Shark. The local Police Chief (Roy Scheider), a grizzled Ex-Navy man (Robert Shaw), and a Marine Biologist (Richard Dreyfuss) join forces in attempting to catch the shark. 11-25-2014 The Cotton Club (1984) (R). New York City in the 1930’s, the lives of the Jazz musicians and dancers who perform, and the ruthless gangsters and jet-set who wine and dine at this famous Harlem Night Club cross paths. Starring Gregory Hines and Richard Gere. 12-9-2014 Coffy (1973) (R). A nurse becomes a one woman wrecking crew when she seeks revenge on the drug-pushers who hooked her little sister on heroin. Starring Pam Grier. 12-23-2014 A Christmas Story (1983) (PG). It’s the Christmas season in 1940’s Indiana. Young Ralphie wants a Red Rider B.B. gun for Christmas, but every adult he talks to including a department store Santa tells him: “you’ll shoot your eye out, kid!” Will Ralphie’s Christmas wishes come true? MOVIES START AT 6:00 pm. 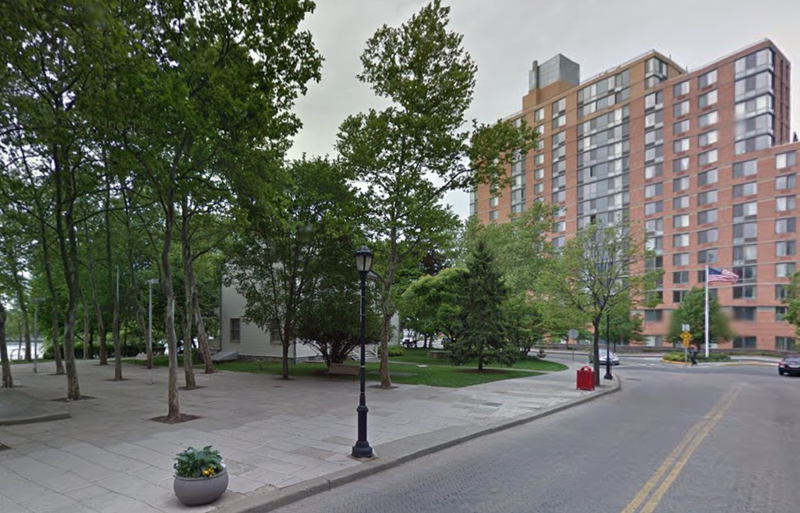 You can find more free events at the Roosevelt Island Public Library here.